It's NHL draft day and a handful of teams around the Hockeyverse have jerseys and logos to unveil at some point tonight. So what good would Icethetics be if it didn't offer you a checklist of what's coming? Did I miss anything? Drop me a line if so. Otherwise, these are the new logo and sweaters we're keeping an eye out for tonight. It's just after 7 PM and we can check everything off of our Draft Day Checklist above. Islanders unveil new road sweaterThe New York Islanders unveiled their new road jersey at their Draft Party tonight. As promised, last year's No. 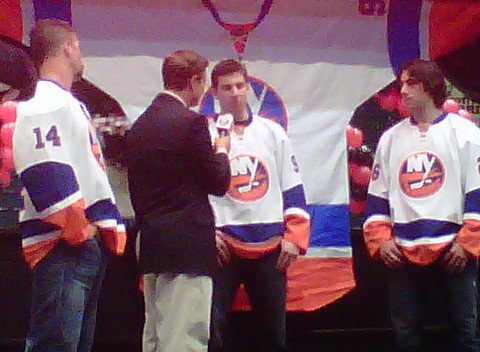 1 overall pick John Tavares was on hand to model it alongside Matt Moulson and Trevor Gillies. A couple of photos were posted to the Islanders' Facebook page. As expected, the new sweater is a white version of the blue jersey introduced two years ago as an alternate uniform. Both are throwbacks to sweaters worn by the Isles during the first 20 years of their existence — colors and all. Checkers unveil new uniformsThe AHL's Charlotte Checkers have unveiled their new home, road and third uniforms along with a special alternate logo. They did so at their NHL draft party tonight in Charlotte. And as predicted, the home and road jerseys are carbon copies of what their NHL affiliate Carolina Hurricanes wear. There was a surprise, though, that came by way of the third jersey. The black sweater features a brand new logo, which combines elements of Checkers and Hurricanes identities — incorporating the Canes' red storm flag. Checkers' new alternate logoThe jerseys and logo were revealed by way of the Checkers' Twitter account tonight. The team has planned an overhaul of its website in July. While it currently features relevant news, the design is a carryover from their recent years in the ECHL when their colors were blue and red. And on a personal note, I have to say I'm impressed with the new logo. Yes, it may seem weird that a polar bear is carrying a tropical storm flag on a hockey stick, but I just think the mark itself looks great! The integration is nice so long as the Checkers and Hurricanes remain affiliated. When/if that ends, the logo becomes obsolete since, again, it's a polar bear with a tropical storm flag. The Greenville Road Warriors was revealed as the long-awaited name of the newest member of the ECHL tonight. The team's name colors and logo were unveiled in an announcement by owner Neil Smith to fans in Greenville at the big event and on the club's new website, greenvilleroadwarriors.com. 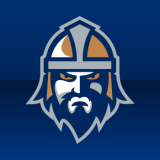 The name pays tribute to Greenville-Spartanburg’s current day business and cultural presence, while the logo features an intimidating warrior ready for battle. With the highway behind him, the fearless fighter appears on the road to victory. The area hosts an integral piece of the South’s growing automotive industry — BMW manufacturing, tire manufacturer Michelin and Clemson University’s International Center for Automotive Research all make enormous contributions to the local economy — as well as a large and supportive communities geared towards cycling and race car enthusiasts. Additionally, the team’s blue, white and copper colors mirror items unique to South Carolina. The blue and white represent the colors in the South Carolina state flag, while the copper highlights are similar to the sunset found on the state’s license plate — and typically on the horizon. It wouldn't have been my first choice, but I don't live in Greenville. And you know what? It's better than Grrrowl. Isn't it?